Grading sizing and separating are essential functions in many processing lines. Food grading may involve inspection, assessment and sorting of various foods regarding quality, freshness, legal conformity and market value. Sorting may be carried out using size, shape and quality. 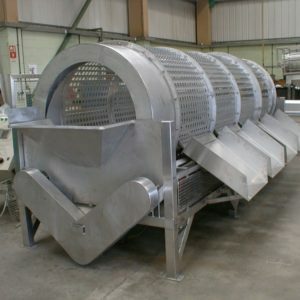 For example, machinery can be used to remove spoiled food from the otherwise fresh product. Dodman has considerable experience in the design and manufacture of high-quality vegetable grading lines for a wide variety of crops. 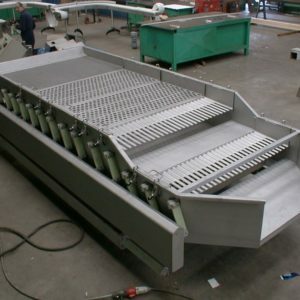 We manufacture two main types of grading systems, Rotary Graders and Screen Graders. We use our expertise to ensure that your product is handled gently and graded accurately. Our Screen Graders are particularly efficient for grading products such as potatoes, peas and mushrooms. The Dodman Roller Graders are extremely flexible and efficient for grading most root vegetables including carrots and onions. Dodman is committed to provide its users with exceptional performance and services, to meet the growing demand for grading, sizing and separating equipment. Dodman incorporates sophisticated technologies to enhance the power and convenience of each machine. Our versatile approach means that each Dodman grading, sizing and separating machine is tailored to a customer’s specific requirements. All machines are built to order and entirely manufactured in the UK to suit your precise requirements.